I purchased a three-show package at New Century Theatre (the newest of the Hennepin Theaters), mostly because I really wanted to see 2 Sugars, Room for Cream, and the other two shows in the package looked interesting: Deer Camp The Musical (starring Newhart's brothers Darryl) and A Don't Hug Me Christmas Carol. I found 2 Sugars, Room for Cream to be a delightfully original sketch comedy, and the other two... well, let's just say they didn't quite live up to what I believe musical theater can do (see this and this). That being said, I chuckled more than once, and the audience seemed to be having a great time. A Don't Hug Me Christmas Carol is very similar in structure and feel to Deer Camp The Musical, but since I can relate to the traditional Minnesota Christmas more than I can relate to a weekend getaway based on killing animals, I enjoyed this one a little more. 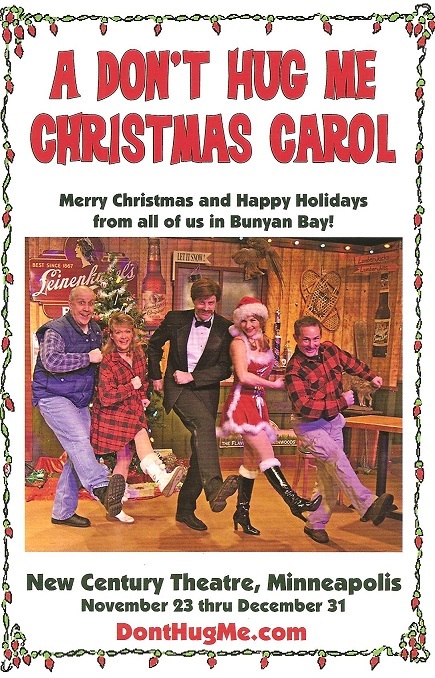 It's a very loose retelling of the Dickens classic A Christmas Carol, set in small town Minnesota. Local bar owner Gunnar falls in the frozen lake and is in a coma, whereupon he's visited by his romantic and musical rival, Sven Jorgenson, showing him his past, present, and future. And like in the classic story, this Scrooge learns to be a little more kind and grateful, and yes, even allow his wife to hug him every once in a while. A very enthusiastic and talented cast make the most of the material they're given. Number one among them is Bonni Allen as Gunner's long-suffering wife Clara. Bonni played Kate Monster in Mixed Blood's delightful production of Avenue Q last year, and I was quite amused when she once again put on a puppet, this time in the form of Barbra Streisand (it's a long story). Ross Young also appeared in Deer Camp, and once again he puts everything he's got into grumpy but loveable Gunner. Like Deer Camp, Don't Hug Me's original songs are sung live by the cast to canned music, but at least there's an excuse for it this time - the music comes out of the bar's karaoke machine. Most of the songs are cute and amusing (except for one disappointingly homophobic song). And I can never resist a singalong, even if it's to a stupid song about Grandma cutting the cheese. 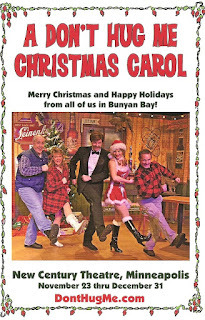 The dancing that accompanies the songs is also quite amusing (choreographed by Doug Anderson, who also plays the dimwitted bar patron Kanute, perhaps a nickname for Knutson?). The spirit Sven Jorgenson (Michael Lee) gives an amusingly bad Robert Goulet impression. 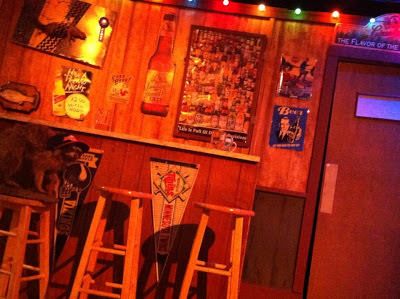 The set is a very realistic looking small town Minnesota bar, judging by the responses I got when I posted a picture of it on Facebook with the caption "guess where I am?" A Christmas Carol wouldn't be A Christmas Carol without Tiny Tim, and he appears here in a very wacky version - actress Emily Moore (who also plays waitress and aspiring singer Bernice) on her knees with a Cockney accent. Again like Deer Camp, this show does not take itself at all seriously, and doesn't try to be more than it is - a silly, entertaining, mindless romp through bad jokes and cheesy story. You gotta respect that.